Kerala Palaces are one of the most important monuments of Kerala, and they are attracting tourists all over the world because of their architectural beauty. Kerala is a southern paradise with its glorious past, which should not be missed. Padmanabhapuram Palace is located in a small village called Padmanabhapuram, 65 kilometers from Trivandrum (Thiruvananthapuram) in Kerala State, Thucklai, on the way to Kanyakumari. It is a vivid reminder of the rulers of Old Travancore or Venad State.Ruler Iravi Varma Kulasekhara Perumal (1592 A.D. and 1609 A.D.) constructed the palace complex in 1601 AD, but the construction was completed in 1744 AD, in the Travancore architectural style. After the construction work was over, it was named Sri Padmanbha Perumal Palace in dedication of Lord Padmanabha.This is famous for its 17th and 18th century murals, carved mahogany ceiling, colored mica windows, secret underground passages, inner courtyards, durbal hall, museum, four poster medicinal bed, Belgian mirror, pictures of Lord Krishna, granite dance halls and special black shiny floors. The palace is a well preserved structure of Kerala palaces,and stands as a proud example of the cultural heritage of Travancore. 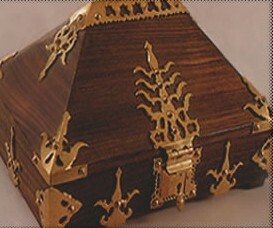 It displays the splendor of the craftsmanship of the people of the bygone days. Padmanabhapuram Palace is a magnificent structure that speaks volumes about the ancient architecture of Kerala. On a visit to this palace one can experience the beauty of the traditional wooden architecture of Kerala. It is one of the famous Kerala palaces and tourist destinations. Sakthan Thampuran Palace is located at Trichur (Thrissur) in Kerala. It is an important landmark in the town and also has much historical significance. It is built in Dutch style in 1795. It is also called as Vadakkekara Palace. The Shakthan Thampuran Palace highlights several interesting and outstanding aspects of the former rulers of Kochi. 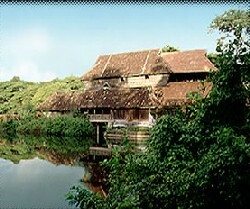 The main structure of the palace has a two-storied building and a conventional Kerala style Naalukettu. Among Kerala palaces, it is a major tourist attraction and all history lovers will definitely want to go through this magnificent piece of historical monument. 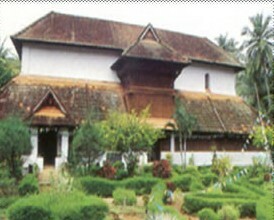 Poonjar Palace is located at Poonjar on the Pala-Erattupetta route, Kottayam District. The Poonjar Palace is a glorious testimony to the regal opulence of a bygone era. Near the palace is an amazing replica of the Madurai Meenakshi Temple. The palace has an amazing collection of royal antiques like palanquin, weapons of warfare, grand chandeliers, jewel boxes and beautiful sculptures of Nataraja (dancing poses of Lord Shiva).The most fascinating thing here is the Chuttuvilakku (row of lamps) carved out on the stonewalls of the Sastha Temple nearby. Koyikkal Palace is located at Nedumangad, 18 kilometers from Trivandrum, on the way to the Ponmudi hill station and the Courtalam waterfalls of the Thiruvananthapuram district. This ancient palace is built in the traditional Kerala architectural style with slanting roofs and a courtyard inside. It was built for the queen of the Venad Royal family who ruled this land between 1677 and 1684. The Place has a popular folklore museum, as well as a Numismatics Museum, set up by the archeological department. The Folklore museum, set up in 1992 has a valuable treasure of musical instruments, occupational utensils, folk art models etc. The Numismatics Museum in the ground floor of the palace is one of its kind, exhibiting a rare and historically priceless collection of coins. It is yet another major tourist attraction. Bolghatty Palace is located on the Bolghatty Island just off the coast of Cochin, the Queen of the Arabian Sea. It was built in 1744 AD by the Dutch traders. Later it was leased to the British. This Palace was used as a British Governor's residence whenever he was in India. It was later handed over to the Kerala Government in 1947. Set amidst lush, tropical greenery, this prestigious heritage hotel is the property of Kerala Tourism Development Corporation. Now it is the largest chain of hotels in the state. It is considered to be the pearl of the Indian Ocean. The Bolghatty palace is two-storied building containing well-decorated bed chambers and a huge lounge, which exhibits historical portraits. It is one of the mostly visited places of Kerala palaces. It is easily accessible with the help of the ferry services that are provided for tourists. Mattancherry Palace is located at Mattacherry in Kochi. It was built by the portuguese for the Raja Veera Kerala Varma of Kochi in 1555 at Mattancherry. It was renovated in 1663 and since then it is also known as Dutch Palace. 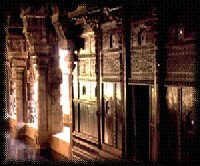 It has a large central courtyard and a temple. The style of painting, used in the murals decorate the walls. The Central Hall on the upper storey was once used as the venue for the coronation of Cochin's rajas, and has a beautifully carved wooden ceiling. The palace with a Bhagavathi temple in the central courtyard is built similar to the typical Kerala style mansion, the Nalukettu- the home of the nobility, aristocracy and upper classes; with four separate wings opening out to a central courtyard. There is an entire gallery of regal memorabilia, including costumes, palanquins, turbans and weaponry from the days of the Cochin rajas in the Palace. 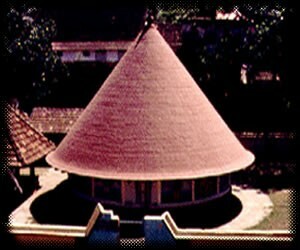 It is one of the important monuments of Kerala palaces. Krishnapuram Palace is located in Kayamkulam, about 47 km fromAlappuzha. This palace was restructured during the 18th century and again renovated using scientific techniques. The most interesting exhibits displayed here is the Gajendra Moksham, spread over 49 sq meters, which is the largest band of mural painting that has been discovered in Kerala. The family deity of the Kayamkulam rajas was Lord Vishnu and His mural was placed at the palace entrance so that the kings could worship Him after their bath. The other attractive features of the Krishnapuram Palace are the beautiful gardens, the newly constructed Buddha Mandapam, rare antique bronze sculptures and remarkable paintings at the Museum. It is also one of important places of Kerala tourist attractions and also of Kerala palaces. Alwaye Palace stands overlooking the Periyar River and offers a beautiful sight from its circular balconies. Kanakakunnu Palace is situated in the heart of Thiruvananthapuram city. It is where the Travancore royal family once entertained their guests is on top of a hill. Now it belongs to the Government. Today this palace, among the Kerala places, is the the venue for many cultural meets and programmes. An all India Dance Festival Nishagandhi (October to March) is organised by the Department of Tourism every year in the palace ground . During this period the classical Indian Dance Performances are conducted every day. The festival organised by the Kerala Tourism Development Corporation is free and is usually accompanied with vocal, instrumental or fusion music. The Festival also showcases the traditional handicrafts of Kerala and the cuisines of India in the adjacent Sooryakanthi Fair Ground, also within the palace.